Have you fed up of purchasing banal ornaments that possess no sparkle and always create a poor impression and compel you to buy something exceptional and noteworthy? 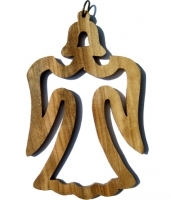 That is why HolyLand-Gifts.com offers a wide and exhaustive assortment of selective and elegantly crafted wood Christmas ornaments that are made from highly quality olive wood and are crafted by skilled artisans of Bethlehem. Firmly believing in reliability, best price and quality products, we leave no stone unturned to make our new as well as existing customers feel happy and satisfied with the ornaments that are exquisite, astonishing and decor your house. With us, you can have unique and precious wooden bell nativity set, Bethlehem star, angel with harp, holy family at monger, angel olive, angel over Bethlehem, baby Jesus in manger, shepherd boy, and three wise men ornaments made from olive wood. At our reliable, custom and user-friendly website, you find the best quality wood Christmas ornament made from fine quality olive wood. This is the best place to get wood Christmas ornament related supplies.